I’m going to jump right into how to use a texure atlas for animations in this tutorial so if you want a little more background on sprites and how we can use them for animations check out this tutorial first – make sure to come back to this tutorial though, using an atlas is far superior to using a spritesheet. There is no technical advantage of using a sprite sheet at all. They tend to use more space both in memory and bandwidth because they don&apos;t pack frame data as efficiently as a texture atlas does. However, there are lots of legacy graphics out there in that format, and its still quite popular today. So we support them. But you should try and pack graphics into atlases where possible to save on ram. I switched to using an atlas instead. Richard is the creator of Phaser so it&apos;s safe to say he probably knows what he&apos;s talking about. Not all frames have to be the same size when using an atlas. I&apos;m going to go over how you can create your own texture atlas and how to use it to create animations in Phaser. A lot of people use Texture Packer to create sprites and atlases but it is a paid tool after the free trial. I&apos;ve been using this free tool recently which seems to do the job very well. There&apos;s also a variety of other tools out there to do this including web based ones and even command line based tools. What these tools will do is arrange all of the sprites you upload into a single .png file, and they will also create either a JSON or XML file that describes the coordinates of where each sprite begins and ends so that Phaser will know how to display it. to either XML or JSON-TP-Array depending on whether you want to use XML or JSON (I will be using JSON for the rest of this example) and then download the resulting file as well. Once you upload some images the textbox field in the image above will contain your JSON or XML file. We will need to load both of these files into the game so you should place them both within the assets folder. The .png file is probably pretty obvious, but let&apos;s take a look at the .json file (As I said, I&apos;m going to be using JSON for the rest of this tutorial, but the XML version is basically the same idea, just sligthly different formatting). This is an example from a game I'm currently building, and shows two frames from my atlas file (I dumped all the rest because it is a very long file). The important parts here are that it provides a name for a specific sprite and also provides the coordinates for where it is located in the image. Now if we refer to a specific sprite by it's frame name, Phaser will know how to display it. The way you create animations with an atlas is pretty similar to the way you do it for a spritesheet, but it is slightly different. First, let's load up our assets. 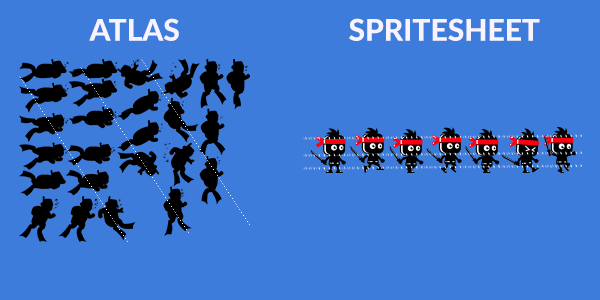 Next we will add the sprite to the game (the same way you would any sprite) and create an animation for it. As you can see the <strong>animations.add()</strong> function call is the same as what you would usually do, except I'm using the <strong>generateFrameNames</strong> helper method here. You need to supply an array of frame names that will make up the animation as the second parameter, and rather than writing all these out manually, <strong>generateFrameNames</strong> will automatically create an array of names for you if they are in a common format. 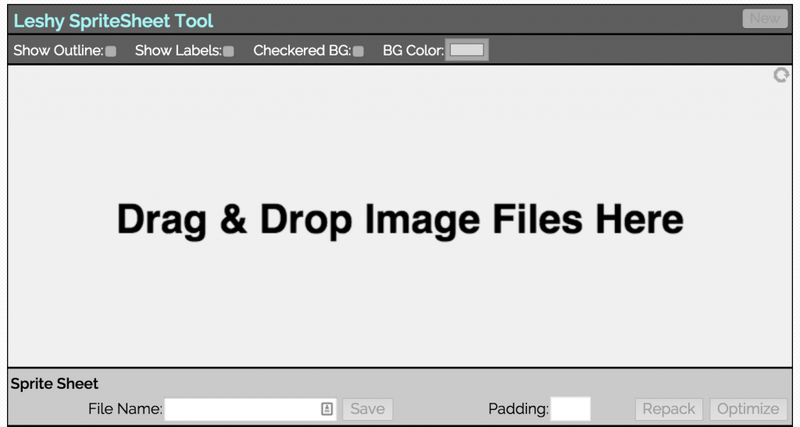 There are also additional parameters you can add to this helper function for different file name formats, for examples you might have named your files something like <strong>dying_0001.png</strong> instead. You can check out the full documentation for the function <a href="http://phaser.io/docs/2.4.3/Phaser.Animation.html#.generateFrameNames">here</a>. Of course, you could also just write this out manually if you want but when you've got an animation that's 20 frames long it certainly helps to speed up development and also makes your code look a lot cleaner. All that's left to do now is play the animation. That's not actually my death animation, it's my swimming animation but you get the idea! What I really like about using a texture atlas over a sprite sheet is that you don't have to worry about making all of your sprites the same size (which might not be desirable for your game) and it makes it super easy to generate animations by referencing the names of the files (especially with the help of <strong>generateFrameNames</strong>) rather than specifying the frame names by number like in my other tutorial. If you're currently using spritesheets for animations I highly recommend switching to an atlas.